Jacqueline White’s decade-long career spanned only two studios—MGM (‘42-‘46) and RKO-Radio (‘47-‘52). 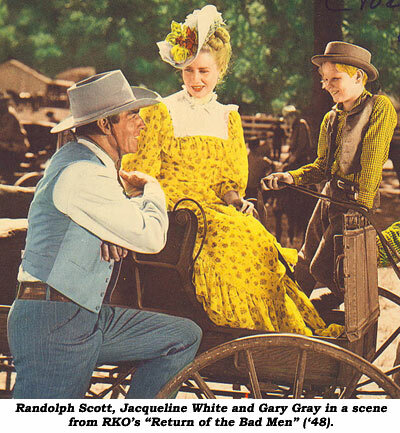 It was at the latter where she made her three westerns, “Return of the Bad Men” (‘48) with Randolph Scott, “Riders of the Range” (‘49) with Tim Holt and “The Capture” (‘50) with Lew Ayres. Also landing his first major part at RKO was 10 year old Gary Gray. “A nice little boy! I like Gary, and I did get to know him! He was so sharp and bright. A very charming, good looking youngster." 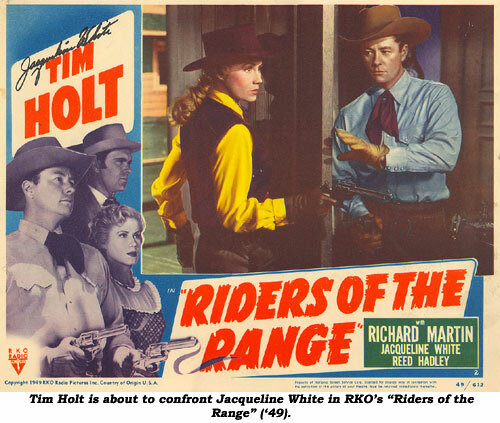 Movies: Return of the Badmen (‘48 RKO)—Randolph Scott; The Capture (‘50 RKO)—Lew Ayres; Riders of the Range (‘50 RKO)—Tim Holt.